Throughout the Northern Hemisphere more then 100 varieties of pine (Pinus) trees exist. In North America 35 native species grow in abundance. Numerous other pine tree varieties have also taken up residence, such as the Austrian and Scots pines. All pine trees hold the classification of being evergreens. The trees produce long needles, unlike firs and other types of evergreens. The growth of pine tree needles is unique to the species. Depending on the pine tree variety, the needles grow in clusters of two, three or five. Needles grow quite long and often range in length from 4 to 12 inches. The cones of a pine tree take two to three years to reach maturity, depending on the pine variety. Cones appear long and scaly as they grow. They normally have thorns to offer protection to their valuable seeds. Numerous pine varieties have cones that remain sealed shut with abundant amounts of resin. The only way for the cone to open and the resin to melt is if the cone is subjected to extreme heat from a forest fire. 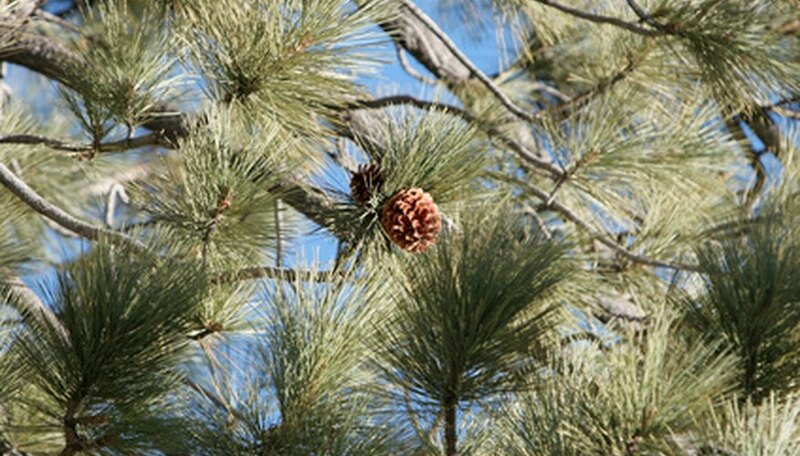 Lodgepole pine requires a forest fire before its cones open to disperse seeds and germination growth can begin. Once pine cones are subjected to heat (cones that require heat to disperse their seeds are known as serotinous) or simply open with maturity, the seeds are dispersed so seedlings can grow. A few varieties of pine trees offer small seeds that are easily carried on the wind for dispersal. Other varieties require animal consumption to disperse the seeds through the bird or mammals elimination process. Most species of pine trees offer superior fire tolerance, which aids in their growth. When a low-intensity fire occurs, competition for light, water and nutrients is eliminated; the pine tree remains due to its tolerance level. This aids the tree in attaining a high level of growth over other species. Young pine trees begin life by developing an exceptionally long taproot verses top growth. When a forest fire sweeps through and kills the top growth, the seedling can still remain alive. Regrowth quickly occurs from the tree's root system. The study of tree growth rings, known as dendrochronology, was first undertaken by Andrew Ellicott Douglass in 1904. Pine tree varieties are the preferred specimens for such studies. For each year of a tree's life a ring is made within the wood of the tree's trunk. Growth rings occur as the tree changes growth rates through the seasons. Each ring reflects a year in its life. The rings are viewable only by looking at a cross section of the tree's trunk. Rings can tell scientists about the weather patterns and environmental changes.